When other members of Blind Faith went on vacation or returned to England following completion of their tour, Clapton continued to disassociate himself from his band-mates and elected to continue his association with the supporting act. He made his way to Los Angeles and joined Delaney and Bonnie Bramlett in the studio to record their new single “Coming Home” (co-written by Clapton) backed with “Groupie (Superstar)”. Since their initial meeting at Madison Square Garden, Clapton got along very well with Delaney Bramlett who encouraged the guitarist to sing even through he had been highly reticent to do so throughout the tenure of Blind Faith. Clapton held the Bramletts and their musicians in high regard and offered to sponsor them on a European tour if Delaney and his band would assist Clapton in recording a solo album. In the interim, Clapton returned to England where he accepted a last-minute invitation by John and Yoko Lennon to join them in performing a concert on October 13, 1969 in Varsity Stadium in Toronto, Canada. Also recruited were drummer Alan White (later of Yes) and Beatles associate/bassist Klaus Voorman. The musicians, dubbed “The Plastic Ono Band”, performed a number of rock and roll classics as well as original compositions by both John and Yoko before an enthusiastic audience. John Lennon was so pleased by the experience that he informed Clapton that he would like to include him in a new group that he would be forming. Clapton did join Lennon in the studio to record a new single, “Cold Turkey”, but nothing more came of their collaboration except for a benefit concert appearance in December featuring a large collection of musicians including George Harrison, Billy Preston, Delaney and Bonnie & Friends, and Keith Moon. The cross-pollination of British and American musicians in 1969 impacted many artists. Billy Preston recorded with the Beatles as early as January of that year and Delaney and Bonnie associates/sidemen such as Leon Russell, Bobby Keys, and Jim Price contributed to the classic Rolling Stone’s album LET IT BLEED. Clapton joined George Harrison in sessions for a proposed Rick Grech solo album but he appeared to be marking time until the arrival of Delaney and Bonnie and Friends. In November the Bramletts and their musicians arrived in London and accepted Clapton’s invitation to stay at his country home while they rehearsed for their European tour and continued to work on material for Clapton’s upcoming album. The guitarist maintained a low profile both on and off stage as his new friends basked in their sudden surge of popularity and he reveled in the anonymity of a large group without the pressures and expectations associated with his customary role as a superstar guitarist. A television clip from that time shows Clapton and former Traffic guitarist Dave Mason playing acoustic guitars as Delaney and Bonnie and Bobby Whitlock harmonized on “Poor Elijah (A Tribute to Robert Johnson)” A video clip of this performance can be found on YouTube. There is no doubt that Clapton admired t! he musicians and genuinely enjoyed being part of a performing troupe. He appeared more laid-back and relaxed than he had at any other point in his career. Other British musicians would soon elect to join the group on tour including Mason and George Harrison (The Beatles). One of their British shows was recorded and released as an album in early 1970. The Jimmy Miller produced album, DELANEY AND BONNIE AND FRIENDS ON TOUR WITH ERIC CLAPTON, was a good representation of their sound at the time and although Clapton maintained a low musical profile he contributed several good solos throughout the album with the most notable example being “I Don’t Want To Discuss It”. Clapton also used the tour to try out new material written with Bramlett. One such song, “Don’t Know Why”, was regularly featured on stage although not included on the aforementioned live album as it was no doubt earmarked for Clapton’s solo debut. A video clip of him performing that song during the tour can be found on YouTube. Clapton’s shift in musical direction was typified by his switch to a Fender Stratocaster guitar rather than the Gibson models he had favored earlier in his career. He also switched from Marshall to Fender amplifiers. His new sound was brighter and thinner than fans and critics had been accustomed to hearing from him and he also strove to make his solos more concise and economic to compliment rather than dominate songs. In his mind, Delaney and Bonnie and Friends probably appeared closer to the Band (Robbie Robertson, Rick Danko, Levon Helm, Richard Manuel & Garth Hudson) in terms of music and camaraderie than to the likes of Cream or Blind Faith. Blatant displays of virtuosity did not match Clapton’s current musical inclination. After some preliminary recording in Olympic Studios in London, the group returned to Los Angeles in January where recording began in earnest for an album which was tentatively (and humorously) titled ERIC SINGS. With the continued encouragement of Delaney Bramlett and liberal doses of peppermint schnapps, Clapton overcame his reluctance to sing and revealed a pleasing tenor voice which sounds remarkably similar to Delaney. Part of the vocal similarity between the two men can be attributed to Clapton providing homage to his latest mentor and part can be attributed to his natural ability as a mimic. The material for the album was very much in the vein of Delaney and Bonnie’s musical fare which suited Clapton very well at that point in time. Due to contractual issues, material on the album was generally credited to Clapton and Bonnie Bramlett although there was no doubt that Delaney was the main proponent. Clapton noted that he did contribute in varying fashion to many of the songs but generally gave the impression that the majority of the songwriting was attributable to Delaney. In truth, songs like “Bottle Of Red Wine”, “Lovin’ You, :Lovin’ Me”, “Told You For The Last Time”, “Lonesome And A Long Way From Home” and “Bad Boy” would not have sounded out of place on a Delaney and Bonnie & Friends album. Other songs were either jams (“Slunky” ), cover versions (J.J. Cale’s “After Midnight”) or written specifically for Clapton (Leon Russell and Clapton’s“Blues Power”). Clearly the material which bore more of Clapton’s identity included “Don’t Know Why” , “Easy Now”, and! “Let It Rain”. It is easy to imagine Clapton actually did co-write these three songs and truthfully none of them would have sounded out of place on the subsequent LAYLA album by Derek and the Dominos. Interestingly, ERIC CLAPTON was the first album by the guitarist not to feature a blues cover. This would not occur again until the 1986 release of AUGUST and the 2005 release of BACK HOME. Delaney and Bonnie’s band were all talented musicians and guest artists such as Stephen Stills and Leon Russell also contributed to the album. Instrumentally however, one of the consistent pleasures of this album would have to be the excellent work of the rhythm section comprised of bassist Carl Radle and drummer Jim Gordan. Radle and Gordan were one of the best rock rhythm sections in the world at that particular time. The horns by Bobby Keys and Jim Price were also a nice touch and distinguished this project from most previous Clapton projects (although horns were featured on several tracks for the Beano album with John Mayall). Both Keys and Price would go on to enjoy lengthy association with the Rolling Stones both in the studio and on stage. The backing vocals contributed primarily by Delaney & Bonnie, Rita Coolidge, and Bobby Whitlock were also prominent and further marked the album as radically different from Clapton’s past body of work. The basic band set-up feat! uring a second guitarist, keyboards, bass, drums, and backing vocals would be used by the guitarist on many occasions in the decades to come. Clapton joined Delaney and Bonnie and their musicians on a short U.S. tour in February 1970 following completion of the sessions for his solo album. He and the Bramletts parted ways in March 1970 as the guitarist returned to England and continued his practice of playing sessions with a wide variety of artists. In the time following his abandonment of Blind Faith, Clapton played on numerous sessions for the likes of such artists as Delaney and Bonnie and Friends (“Coming Home”), John Lennon/Plastic Ono Band (“Cold Turkey”), Leon Russell (“Prince of Peace”), King Curtis (“Teasin’”), and the Crickets. Having distanced himself from the Bramletts as he had previously done with Blind Faith, Clapton continued to play on sessions for artists like Stephen Stills (Go Back Home) and Howlin’ Wolf (The London Sessions). His continued appetite for session work with a wide variety of musical talent appeared deliberate as he sought his own musical identity apart from perceptions formed ! through his association with groups ranging from the Yardbirds to John Mayall’s Bluesbreakers to Cream and finally Blind Faith Tellingly he hinted to one interviewer in April 1970 that he would have joined the band Traffic if he had been invited to do so. That comment is interesting as he had expressed little desire to keep Blind Faith going but still seemed to harbor some hope of working with Steve Winwood. The debut solo album, ERIC CLAPTON, was a well-crafted pop record which sold well upon release in August 1970 and featured a hit single in J.J. Cale’s “After Midnight”. Delaney Bramlett’s production is very good and appropriately he is also credited with providing song arrangements. Interesting enough there were three mixes of the album. Delaney Bramlett was waiting for Clapton to submit new lyrics for a song called “She Rides” which is more commonly known now as “Let It Rain”. Due to communication glitches, the tapes were provided first to Clapton and then to Tom Dowd so that all three men had a chance to mix the album. The official release featured Dowd’s mix although “Easy Now” was a holdover from Clapton’s efforts. Officially, Delaney Bramlett produced and arranged the sessions while Tom Dowd (and Clapton on “Easy Now”) mixed the recorded album. The opening track, “Slunky”, was a driving instrumental featuring solos by Clapton and saxophonist Bobby Keys. “Easy Now” was a gorgeous double-tracked acoustic ballad written by Clapton. “Don’t Know Why” featured a prominent horn arrangement and a strong gospel feel. “Bottle of Red Wine” and “Bad Boy” were good songs very similar to Delaney and Bonnie material, “Blues Power” was a catchy song written by Leon Russell and Clapton which provided a tongue-in-cheek poke at the guitarist’s perceived image. J.J. Cale’s “After Midnight” is now regarded as a classic single and “Let It Rain”, featuring an extended solo, is generally regarded as the best song on the album. “Bottle of Red Wine”, “After Midnight”, “Blues Power”, and “Let It Rain” were Clapton stage favorites for many years. In fact, “After Midnight” was most recently featured in the February 2008 Winwood/Clapton Madison Square Garden concerts. Some critics and fans expressed concern over the obvious influence of the Bramletts and the implication was that this was not truly an Eric Clapton solo album. That view appears shortsighted now as the album was the prototype for future Clapton solo projects with prominent vocals and a marked de-emphasis on guitar heroics in favor of a group-oriented approach in presenting tightly arranged commercially viaable material. ERIC CLAPTON can also be viewed as the stylistic precursor to LAYLA as Clapton’s original material was now based almost exclusively upon personal feelings most notably concerning his tempestuous relationships with the women in his life. “Don’t Know Why”, “Easy Now”, and “Let It Rain” all refer to his preoccupation with Pattie Boyd Harrison. In hindsight, Clapton’s intuitive strategy was flawless. He made himself part of an existing band of talented musicians and took full advantage of suitable material offered/initiated by Delaney Bramlett. It has been intimated over the years that Bramlett used the opportunity to promote himself through his association with Clapton. That may be true but one could also argue that Clapton used Bramlett to establish his solo career with the least amount of effort. At a time in which many individuals were embarking on solo careers, Clapton’s debut album stands up favorably to efforts by the likes of Paul McCartney, George Harrison, and Stephen Stills. A gifted self-promoter, Delaney Bramlett is acknowledged by most people (including Clapton himself) as the man most responsible for encouraging the guitarist to sing and lead his own band. Delaney is also commonly credited with pushing George Harrison to play slide guitar which eventually became his trademark guitar sound and the brash southerner was also hanging out and recording with the likes of singer/songwriter J.J. Cale and guitar virtuoso Duane Allman long before Clapton did the same. Delaney and Bonnie’s career lost momentum when their association with Clapton ended and they divorced several years later. A number of key musicians from their band were drafted into various bands. Some were existing groups such as the Rolling Stones and others were assembled by such friends as Leon Russell (Mad Dogs and Englishmen tour in support of Joe Cocker) and Eric Clapton (Derek and the Dominos). ERIC CLAPTON is an important album in the artist’s career and was his critical link from post Cream/Blind Faith to Derek and the Dominos. The album set the tone for a long solo career which, in typically perverse fashion, Clapton did not resume until 1974. Although this is a fun album which is well worth owning although you can find key tracks such as “After Midnight”, “Blues Power”, and “Let It Rain” on compilation albums such as 1995’s THE CREAM OF CLAPTON. When this album was released it disappointed a few cream fans here in the UK but Clapton could see his future direction in the very under-rated & B s country blues inspired rock...a perfect vehicle for his guitar playing. 'Slunky' is just a jam that was good enough to release....but what a jam!..fantastic brass topped off with Eric's stinging, singing strat. The whole album has quality and remember we're talking about 1970. I don't know of any other album that is quite like it. How to condense the heavy Gibson guitar solos of Cream/blind faith into concise emotionally charged phrases on a strat. Absolutely brilliant. It began in 1968. Feeling professionally trapped by the weight of Cream, Clapton spoke in glowingly terms about the album "Music From Big Pink" by The Band and noted that they were a signpost for him to follow. He publicly lauded their musical direction which emphasized strong compositions coupled with a seamless, unified group approach in stark contrast to Cream's reputation of three competing virtuoso's. It is no wonder that he was intrigued by a tape of Delaney and Bonnie Bramlett provided to him by George Harrison. He probably saw certain similarities between the groups which was appealing and, in his estimation, preferable to the current situation. In 1969, Delaney and Bonnie and Friends were selected as the opening act for Clapton's latest project, Blind Faith, and he took the opportunity to become better acquainted with the Bramletts and their large troupe of musicians. He publicly remarked that they were better than Blind Faith and opted to travel with them on their tour bus from gig to gig rather than travel with the members of his own group. In his mind, Blind Faith, had become another source of worry and he revealed in the camaraderie between the supporting musicians. Clapton and Delaney Bramlett made plans together and after Blind Faith played their final concert in late August of 1969, Clapton joined the Bramletts and their musicians in New York. He co-wrote and played lead guitar on their next single, "Coming Home", and finalized future plans. Clapton would sponsor and accompany the group on a European tour and Delaney Bramlett would assist the guitarist with the recording of his debut solo album. Bramlett realized that a working relationship with Clapton would bolster his band's commercial and financial success. For his part, Clapton realized that he would have a first-rate band to work that he didn't have to form and nurture. Delaney and Bonnie Bramlett was energetic and enthusiastic vocalists and their band included stellar musicians such as bassist Carl Radle, drummer Jim Gordon, keyboardist/vocalist Bobby Whitlock, saxophonist Bobby Keys and trumpeter Jim Price. In November, Delaney and Bonnie and Friends , joined Clapton in Great Britain staying at his house, Hurtwood Edge, while rehearsing for the European tour. Several early tracks for Clapton's album were attempted in Olympic Studios in London but the serious recording did not occur until January 1970 in Los Angeles upon the resulting album, referred to by Delaney Bramlett in the press as "Eric Sings", was a deliberate attempt to reposition Clapton in the musical world. The overall sound and the choice of material was similar to Delaney and Bonnie and Friends which was hardly surprising since they were the backing musicians along with notable guests as Leon Russell (piano), Stephen Stills (guitar), and the Crickets (backing vocals). The album was notably for emphasizing Clapton's appealing tenor voice (fuelled by Delaney's favourite drink: peppermint schnapps) and his switch to Fender Stratocaster guitars. The songs, largely co-written by the Bramletts and, to a lesser extent, Leon Russell, had an anonymous air. Significantly, the album featured "After Midnight" which was the first of Clapton's J.J. Cale covers. Even more significant though was the fact that there were no blues tracks. So, is it worth adding to your Clapton collection? Yes. In many ways, it is the prototype of his musical direction as a solo artist. It is a well produced album (by Delaney Bramlett) and there are also enough solid songs to ensure your listening pleasure. "Slunky" is a good driving instrumental with strong solos by Clapton and saxophonist Bobby Keys. A session with King Curtis around the same approximate time provided evidence of Clapton's musical rapport with saxophonists and predated his later work with Mel Collins ("The Core" from SLOWHAND) and David Sanborn. "After Midnight", "Bottle of Red Wine" and "Blues Power" (co-written with Leon Russell) are strong tracks and well deserving of attention. "Easy Now", written solely by Clapton, is a strong double tracked acoustic number and "Let It Rain" (co-written with Bonnie Bramlett and featuring Stephen Stills on guitar) is a classic. "Bad Boy" and "Don't Know Why" are entertaining as well but "Lovin' You, Lovin' Me", "Lonesome and A Long Way From Home" (allegedly written for Blind Faith by Delaney Bramlett), and "Told You For The Last Time" are weak. There is very little of Clapton's musical personality on this album and he relies too heavily upon the Bramletts for direction. The same criticism could be levelled against him for over-reliance upon Bob Dylan and The Band on NO REASON TO CRY and Phil Collins on "AUGUST". Interestingly, this album was not released until August 1970 when Clapton was working with a number of former Bramlett musicians in Derek and the Dominos. In fact, the hit single from this album, "After Midnight", was released when Derek and the Dominos withdrew their first single, "Tell The Truth"/"Roll It Over" from the market. A number of the songs from this album would be featured on subsequent tours up to and including 2004 concert appearances and "After Midnight" was re-recorded and released as part of a Michelob Beer commercial campaign in 1988. 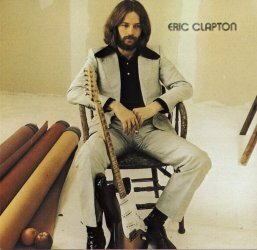 Overall, this is an entertaining album which captures Clapton's musical transition from a guitar hero to a triple threat singer/songwriter/guitarist..
First its his first solo effort and second its his first with a Fender Stratocaster. At the time he was hanging out with members of Delaney and Bonnie and it shows in the music. It opens with "Slunky" which is an instrumental that is not a solid effort. He then goes to Bad Boy, which has a blues feel to it and is worth a listen, Long and lonesome way from home, is a sub-worthy effort. Next is the classic After Midnight and it has a very solid but short guitar solo for you guitar lovers. Easy Now is his acoustic effort and to me still resonates even after 35 years. Bottle of Red Wine shows some energy that had been lacking throughout the CD. Of the remaining songs only Let it Rain is worth the listen. Let it Rain to me is still a classic song of Claptons'. This is not his best effort but it is worth having. A strong debut from the by then already established blues legend. 'Slunky' is a great instrumental opener and sets the tone perfectly for what's to come. 'Bottle of red wine' is a sing along rocker with some fine guitar work and 'blues power' swings along nicely. There are a few niggles but so minor that they really aren't worth a mention, all in all well worth hearing. I remember when the album came out. After midnight was the big hit, but when I started to play it I found a refreshing new EC. Generated, and ready to rock. The album showed a side of Eric that gave him new life, and started to develop a sound that was his, and remains with us today. The soulful sounds, rocking rhythms had many of us listening to Eric Clapton in a new light. Welcome here is Bruser my cat is helping with this review. This album is a great rock 'n' soul album thanks to the production of Delaney Brammlet .You can feel the influence that Delaney had on Eric in this album. But this album has the same affect of "No Reason To Cry". Its a required taste album ,only after you've heard a respected amount of Clapton's material you start to enjoy the album and you get to a point where you listen to it from start to end without skipping one quarter of a second. Although Eric had contributed the occasional song or vocal to his previous groups, he must have surprised many fans with the strong singer/songwriter stance he takes on this first solo album (eight original songs, all but one composed in collaboration, including the concert staples 'Blues Power' and 'Let it Rain'). This album also introduced the music world to Eric's trademark 1970's guitar tone - the out of phase switch-position of a Fender Stratocaster (used with biting effect here on 'Slunky', 'Bottle of Red Wine,' and 'Let it Rain'). Most importantly, however, it was during these sessions that Eric consolidated his partnership with Bobby Whitlock, Carl Radle, and Jim Gordan - the musicians who with Eric would go on to become Derek and the Dominos. As such, this record was something of a warm-up for the superb 'Layla and Other Assorted Love Songs', one of the greatest records in rock history! This E.C. masterpiece is one of the essential elements of Clapton's discography. From the opening pieces of "Slunky" and "Bad Boy", it is evident that Clapton is going to continue to deliver the goods that were being demonstrated in his early days with the Yardbirds, Cream, etc. Throughout the whole album, Clapton plays with a type of perseverance, confidence, and soulful emotion that could keep his listeners singing his songs in their heads all day. This is true for the whole album, right down to the last song "Let it Rain". To this day, I can't here that song without dropping what I'm doing and picking up my guitar and singing to it. Clapton is simply the best, period!! !